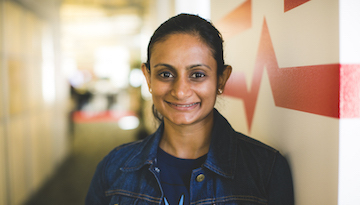 Our latest product management confessions features Mina Radhakrishnan, startup advisor at Cowboy Ventures and former Head of Product at Uber. We’ll post more from Mina next week! Matt Pasienski: I was reading these books on how to do good interviews. Like anything, there's probably a lot of good stored knowledge, but it was mostly about how do you deal with a KG interviewee and like what if they really don't want to talk you, and how can you open them up. I'm here with Mina Radhakrishnan who was the head of product from the time Uber was 20 people? Mina R.: Yeah, just about back in July of 2011. Matt Pasienski: All the way up until this previous year. You're now working with a lot of startup companies and venture capitalist to help advise what are the best practices of product management, and so this is what we want to ask you about right here. I would say that you have a company that's now worth $40 billion-something dollars. You were there the entire path and what we've learned as we've dug through these things is that there's not one method to product management, it's a lot of just hand fighting like in the streets, dog fight, and there's no company that better represents that type of tenacious product development than Uber. Very happy to have you here. I think this is actually probably the talk I'm most excited to hear about. To jump right into it, you had to develop in an extraordinarily complex and ever changing, and high-pressure realm. What is your general philosophy for success when you can't tell what's going to happen three months down the road? Mina R.: I think the most important thing is really to just be opened to adapting. You come out, especially as a PM, with this road map, you got this grand plan like V1, V2, V3, V4 and then partly in through V1 something changes externally and it's not in your control. Part of it is just always being aware and accepting that things are going to change and that's okay because they're going to change, and you're going to change to adapt to them and ultimately what you end up doing is going to benefit the company, and it's going to be the right thing to do. A lot of it just being aware that like, "Hey, things are always going to crazy, all the time. That's okay." Matt Pasienski: That sounds almost like pessimism, but I think there's like a lot of things you've identified. I heard a story you were talking about where you were developing and one month before the web, Travis wants to roll out Paris. What are the type of things that knowing that's going to happen, you can do in advance and prepare yourself to sustainably meet those types of challenges that come quickly. Mina R.: Yeah, totally. If there's one thing I've learned from Travis, and this is definitely the way in which I think product development happens at Uber, and I think it's true in most companies, is that the culture and the way in which you do things is very reflective of the CEO, and Travis is an incredibly intense, driven individual and that kind of filters down through everybody who works at the company. I would say the one thing, that I think, I really learned from that was like, you don't have the question of "Can it be done?," you only ask the question, "How can it be done?" That's a really powerful tool to take with you. I remember coming in, it was a Monday morning and Travis said he was going to speak at the web, and it would be awesome if we could have Paris, hey by the way, like in a month. It was like, "Okay, well we've got a ton of things on the plate." Let's just put those aside for a second and say, "How would we make this happen?" What are the things we would need to do? Because I think the approach you want to be able to take to these kinds of things that just come, is like not even a question first of like should you do it? It's just like what would it take to it? You go through and you prioritize, and you say, "All right, well here's the list of the this, sort of, 30 or 40 things we need to do to make this happen," and then you can sit down and have a real conversation about does it make sense to do it? Because people are always going come up with great, fun cool ideas, right? There's no lack of ideas, I think, especially when you work in a creative environment, when you got lots of people, when it's exciting, change driven kind of place, you always have new ideas and new things that are coming up. I think a good approach to that is not to come out with it saying, "Oh no, we can't do that. We've got all of this other stuff on the plan," like, "Oh interesting. Okay, if we were to do that, what would it take?" Then you look at it and you can have the right framework in which to look at it where you're comparing four or five different things. You're seeing the level of work that's there in all of them and you have a sense and understanding of what is the actual benefit and the value of what those things are going to be. Matt Pasienski: As Uber grows from a tiny company that has two cities and some cars driving around to this massive company, how do you project that type of framework to a very large operations and obviously you have marketing, you have your engineer, like there's all these different parties, how do you project these kind of mental frameworks for operation, when planning is not really something that you can do that far out in advance? Mina R.: It's a great question and I think also one of the things that makes Uber especially interesting, and companies in that kind of market place situation, is that you have these sort of these two things that are really powering the company. On the one hand, you got product. You have engineering, design, like you got your technology team, but you also have this really heavy logistical and operations team that's going forward. One of the dilemmas that we were constantly faced with is a city would come to us, even a big city because that's generally how Uber was organized in the sort of the earlier days is like cities and then eventually grew into countries, and regions and areas, but you have a city team that comes to you and says," Hey if you do this one thing, we're going to grow 400% and we can prove why." They've done the work and they've sort of gone through it and in the meantime you, as a product team, are trying to build out a infrastructure in which every single country in the world can have payments, so it's really hard to say no to those kind of things, but that's, unfortunately, kind of the reality of what you have to do, right? Matt Pasienski: Maybe when you are talking about planning, it's the ability to say no. I've met a couple of your field team, these are like hyper focused, type A, they're out there, they're just ripping things up in random cities around the world, how do you tell these people, "No you can't have what you want," when they get what they want and that's why they were hired by Uber? Mina R.: It's a question I think you face in a lot of product challenges, right? Generally you have a number of different stakeholders and some people are going to be happy and some people are not going to be happy. I think the difference is not leaving it at no, but saying, "No and here's why." Posted by on Thursday, May 7, 2015.